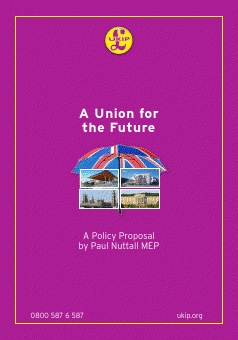 Paul Nuttall MEP is on The Political Spot on Channel 4 tomorrow at 6:55pm talking about the Union for the Future policy. There has been a great deal of interest in the policy which calls for a renewal of the union on a federal basis with effective and equal devolved government for all four member states of the UK. That interest has resulted in a number of new members and defections from other parties, mostly from the English Democrats. I'm told that the policy has a couple of gaps that need addressing before it is published in full and that it will definitely be for devolved government with a devolved executive (ie. an English Parliament) and not a Grand Committee of British MPs elected in England as claimed by one of the English Democrats' main financiers.